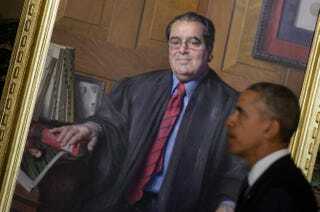 President Barack Obama passes a portrait of Justice Antonin Scalia after paying respects as Scalia’s body lies in repose at the U.S. Supreme Court Building in Washington, D.C., on Feb. 19, 2016. President Barack Obama has taken to SCOTUSblog to describe the qualities he will be looking for in his nominee to replace Justice Antonin Scalia on the Supreme Court. In the blog post titled "A Responsibility I Take Seriously," Obama noted that this particular duty is one that he intends to fulfill in the weeks ahead, while also detailing what he'll be looking for in the new justice. "First and foremost, the person I appoint will be eminently qualified. He or she will have an independent mind, rigorous intellect, impeccable credentials, and a record of excellence and integrity. I'm looking for a mastery of the law, with an ability to hone in on the key issues before the Court, and provide clear answers to complex legal questions," Obama wrote. "Second, the person I appoint will be someone who recognizes the limits of the judiciary's role; who understands that a judge's job is to interpret the law, not make the law. I seek judges who approach decisions without any particular ideology or agenda, but rather a commitment to impartial justice, a respect for precedent, and a determination to faithfully apply the law to the facts at hand," the president added. In situations where the law is not clear, Obama is hoping to select someone with "the kind of life experience earned outside the classroom and the courtroom; experience that suggests he or she views the law not only as an intellectual exercise, but also grasps the way it affects the daily reality of people's lives in a big, complicated democracy, and in rapidly changing times." The president's blog post comes as Senate Republicans have reportedly agreed that they will not be taking any action on whomever the White House nominates, believing that this right belongs to the person who will succeed Obama. "I can now confidently say the view shared by virtually everybody in my conference is that the nomination should be made by the president the people elect in the election that's under way right now," Senate Majority Leader Mitch McConnell (R-Ky.) said at a news conference, according to NPR. "I believe the overwhelming view of the Republican Conference in the Senate is that this nomination should not be filled, this vacancy should not be filled by this lame-duck president." All 11 Republican members of the Judiciary Committee signed a letter Tuesday saying that they would not move forward on any nomination made by Obama. Members have signaled that they would even refuse to meet one-on-one with the nominee, which is a long-established Senate custom in the confirmation process, NPR notes. Read more at SCOTUSblog and NPR.